Welcome to my blog! 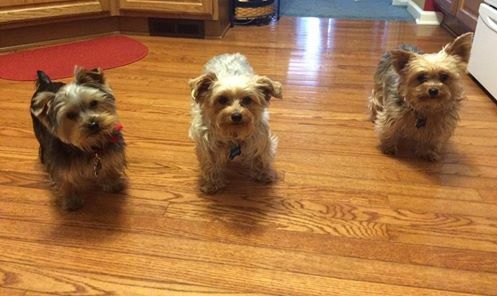 I am so anxious for you to meet my three Yorkshire Terriers, Artie, Buddy, and Coby! My husband and I call them ABC for short! ABC are our babies!! You see we never had any human babies, but we love our doggie babies just the same. We live in Canton, MI where today we are experiencing some crazy weather. We’ve had a combination of snow, sleet, and rain, but that doesn’t stop ABC from venturing outside! They love the great outdoors much more than me on these cold winter days. This picture was taken just after coming indoors today. You probably can’t see the snow all over their beautiful coats, but they were covered with it. They don’t mind though…they just shake it off or let it melt away. Such crazy boys!! !